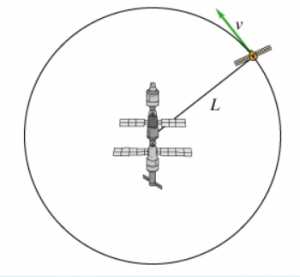 Six artificial satellites circle a space station at constant speed. The mass m of each satellite, distance L from the space station, and the speed v of each satellite are listed below. The satellites fire rockets that provide the force needed to maintain a circular orbit around the space station. The gravitational force is negligible. 1. Rank each satellite based on its period. 2. Rank each satellite based on its acceleration.